As I scanned through the Cookies, Bars, & Biscotti section of The Modern Baker, these cookies caught my eye. I mean, who wouldn’t love cookies made with honey-roasted peanuts? The only ingredient I didn’t already have in the cupboard was the peanuts, so I picked up a can the next time I was at the store. 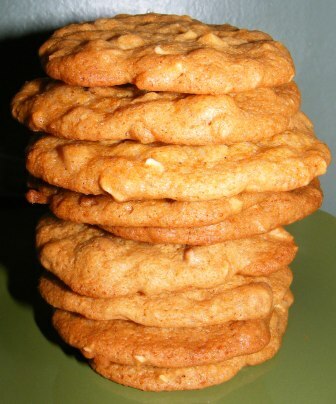 I knew if I could keep everyone away from the peanuts, I could make these cookies anytime I got a taste for them. So the other day when I saw that Abby had made these and really liked them, I decided the time was right. I had just ordered a pizza, and the recipe looked easy enough to make while I waited for the pizza guy to get here. Other than the honey-roasted peanuts, these cookies contain flour, baking soda, sugar, honey, egg, and butter. I began by mixing the flour and baking soda in a bowl, then whisking together the sugar, honey, and egg in another bowl. I mixed in the butter, then the flour, and finally the peanuts. I dropped the dough onto cookie sheets lined with Silpat, then flattened the dough with wet fingers. I’m not sure I flattened them quite enough, or perhaps I used too much dough for each cookie, but my cookies weren’t as thin and crispy as Abby’s or the ones pictured in the book. They were fairly crisp, though, especially after they cooled completely. These cookies were really delicious. At first, I thought they were just OK, but after they sat overnight, they were amazing. It’s great to have a cookie that you can mix up and bake in the time it takes to get a pizza delivered. And when it’s a cookie that’s this delicious, it might just be dangerous, too. 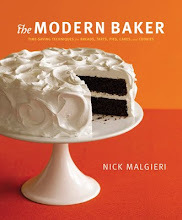 Since I am blogging nearly every recipe in The Modern Baker, I am not publishing the recipes. If you like what you see in this and other posts, I would encourage you to buy the book. I guarantee you won’t regret it. If you’d like to test drive a few of Nick’s recipes before committing yourself, he has a number of them, including the Honey Peanut Wafers, on his blog. Oh, these look so tasty!! I was wondering if they were supposed to be as wafer-thin as mine….yours look a little chewier, which I would really like! The ones in the book look about as thin as yours, so I think mine were supposed to be thinner. But I agree, a little chewy is great! That stack is so beautiful…I can never take good stacked photos like that…really shows this cookie off nicely. I think this is next on my list as you all rave about it so much that I definitely need to see what all the fuss is about, and of course, it doesn’t have chocolate in it, so that’s another good reason to move it up to sooner rather than later. Yours look wonderful. Definitely one to make sooner rather than later. So easy and very tasty! Sounds like you’ll have to start stocking honey-roasted peanuts… or not stocking them if you have no self control in making cookies! I wasn’t a huge fan of these but I think it’s just a preference thing. They were better than I expected. I’m a honey-roasted peanut fan, but I wasn’t sure about the thin, crispy part. They were so simple and so good! Perfect with pizza. Have to make these soon. Peanuts in cookies. What’s not to love.